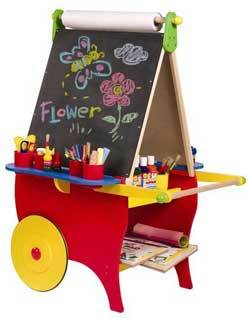 The ultimate easel for young artists! One side is a chalkboard, the other, a dry erase board. Pull down the paper from the paper roll at the top for drawing and painting. 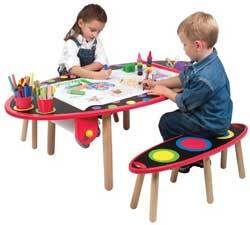 One side has cup holders and comes with 4 storage cups for chalk, crayons or markers. The other side has cup holders for paint and comes with 4 non-spill paint cups. Store your supplies and accessories on the two shelves underneath. Move it around with the large handle. The rubber wheels won't scratch floors. Measures a giant 43.75"H x 31"L, 29"W. The only art center you'll ever need! Assembly required with the included tool.